If you’ve seen the movie “Pay It Forward,” you already have a pretty good idea of what Sneaky Cards is all about. The tagline for this game is “Play It Forward” and it’s similar in concept to the movie. The cards direct you to do nice things for others, engage with strangers, surprise people, and try things that you wouldn’t ordinarily try. After you complete your mission, you hope that others will continue your work by “Playing It Forward” and continuing the game. You are along for the ride in this interactive scavenger hunt that has you spreading joy, fun, and silliness throughout the world. If you’ve ever wanted to be a sneaky ninja of joy (kind of like Santa Claus, but without the reindeer), Sneaky Cards may be the game for you. The only rule of Sneaky Cards is that you must get rid of all of your cards by completing all of the “missions” contained in the cards. Exactly how you carry out each mission is largely left up to you. This game is designed to be played over many days, weeks, or even months, with you getting rid of cards as opportunities arise. Once you’ve completed a mission, the card is either left behind for someone else to find, handed off to someone in the vicinity, or given to someone who helped you complete the activity. 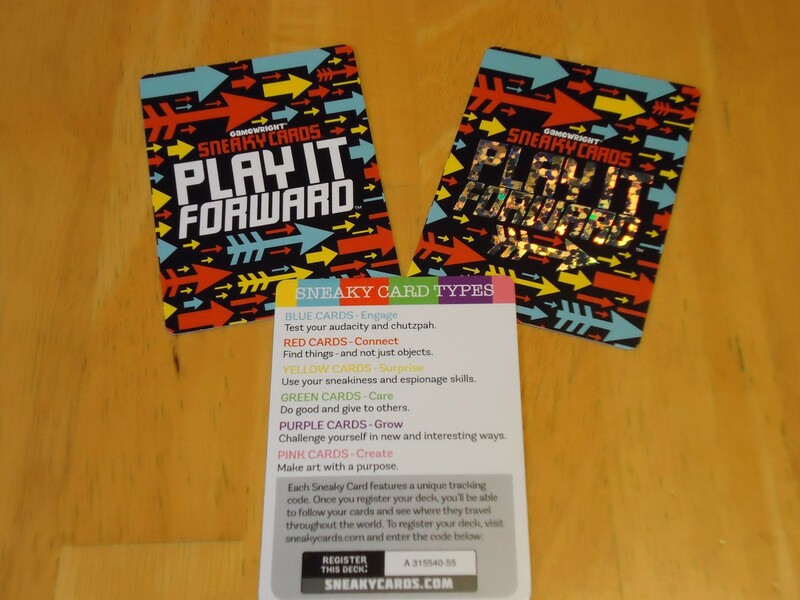 The idea is that this person will now “Play It Forward” by completing the mission and passing the card on to yet another person. Hopefully, you ultimately have a whole chain of people sneaking around carrying out missions of fun and happiness. 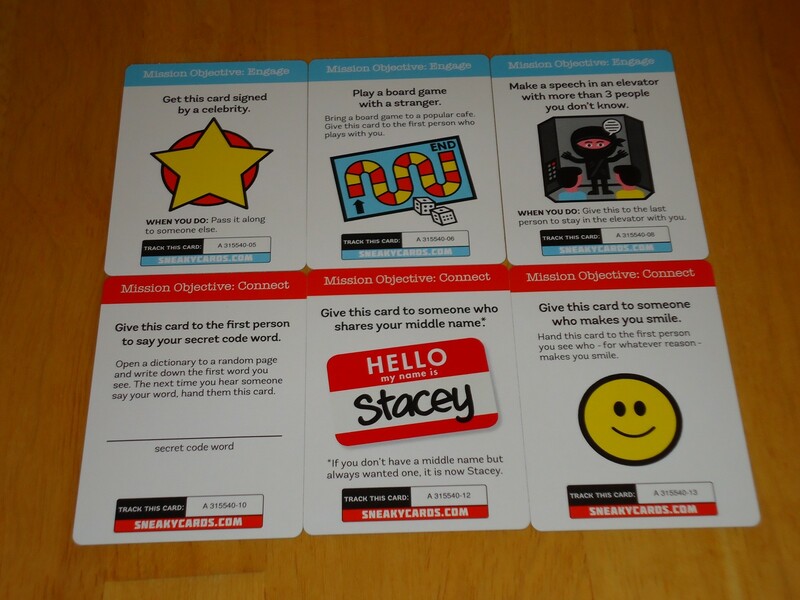 Some of the Engage and Connect cards. Sneaky Cards is primarily played solo, although you can add an element of competition by purchasing multiple sets or dividing one set among several players and having everyone race to be the first to get rid of all of their cards. The honor system will need to apply here as, even with the tracking system described below, there’s no real way to verify that a player has legitimately gotten rid of all of his or her cards. Play with people you trust if the competition matters to you. There are six card colors and nine cards of each color in the game. Each color has a different mission focus. The card types are explained below. Card reference and card backs. The Surprise cards have glittery backs! Once you’ve gotten rid of all of your cards, you’ve “won” the game. However, I would argue that getting rid of any of the cards is a victory, particularly if you’re not a very adventurous person to begin with or if your card brought some happiness to someone’s day. Sneaky Fun or Conspicuous Misery? The irony of Sneaky Cards is that a game with “sneaky” in the title will often make you conspicuous. Many of the activities are very public in nature. The point, after all, is to get you interacting with humanity. If you are terribly shy this game is going to be painful for you. You can stick to the missions that are truly sneaky and which don’t require any interaction, but you’ll only be playing a small part of the game. To “win,” you’re going to have to get out there and act like a fool at times. If the idea of this repulses you, don’t buy this game or at least split the deck with an extrovert. If you’re up for it, though, Sneaky Cards can be a lot of fun. There’s something about running around, acting like a nut, and leaving a trail of cards and bemused people behind that appeals to my sense of the absurd. (I usually act like a nut, anyway, so to have my weird behavior sanctioned under the banner of “playing a game” is great.) There are plenty of surprises to be had in seeing how people react to your missions and you might surprise yourself by becoming bolder than you thought you could be. Some of the Grow and Create cards. Sneaky Cards will probably appeal most to social teens and young adults who like to get out there and engage with life (and who haven’t yet fully developed that, “Public silliness is bad,” disease that afflicts most adults). The age on this game is 12+ and I would agree with that. It’s not that younger kids aren’t capable of understanding how to play; the concepts are simple enough for little kids. But since some of the activities involve approaching strangers or completing missions in public places, this game is best left to older kids and adults who are a bit more aware of their impact on others and the potential dangers of dealing with strangers. Class projects. Give several cards to each student and have them complete the missions. Have them write a report about their mission(s) and use the online tracking to see what becomes of the cards during the school year. Marketing. If you’ve got something to promote, you could attach your business card to the back of the Sneaky Card and perform the mission. As your card moves around, you might find yourself drumming up business. Just the act of doing something nice for someone else and having that attached to your business might be worth some word of mouth goodwill. Office morale/team building. Give cards to your employees or teams and let them perform the missions and then come back and talk about it. You might want to give a team their own deck of cards and let them determine how best to complete the missions together. They could compete against other teams good-naturedly. Ice breaker/party game/holiday tension easer. 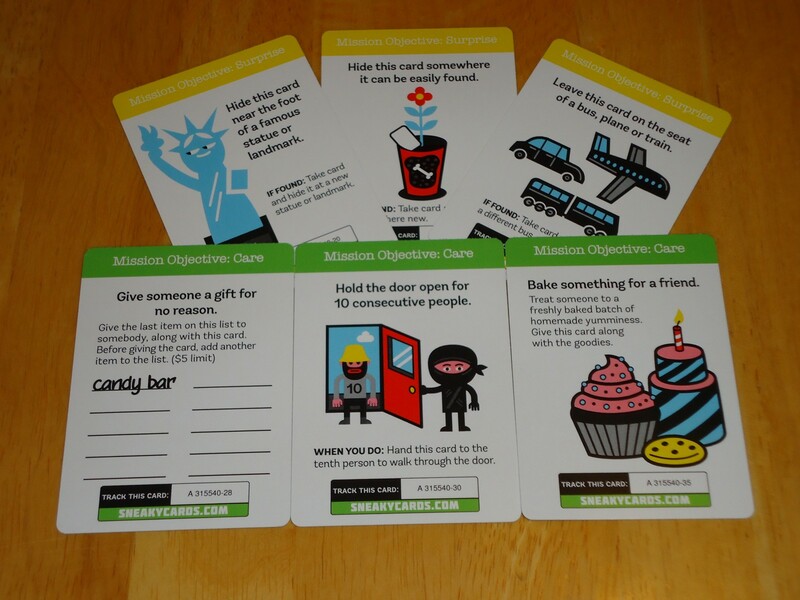 Give some cards to party/conference/convention attendees and let them carry out the missions during the party or conference. The resulting interactions can get people past that initial awkwardness. Or, when you have one of those fraught holiday family gatherings, ease the tension with some fun interaction. It’s especially useful for gatherings that last several days, as that gives people plenty of time to play. Nudge for shy people. If you are shy (or know someone who is) but want to become less so, this can be a way to practice putting yourself out there in small doses and under the less threatening guise of playing a game. New Year’s Resolutions. If your New Year’s Resolution is to be nicer to people, this can be a fun way to accomplish that. Same if your resolution is to meet new people, be more confident, or try new things. Family bonding. There’s no rule that says that each activity has to be completed by an individual. You can bond together as a team and do the missions together with the adults watching over the younger kids during the more public activities, or handling the stranger interaction altogether. This can be a way to let kids younger than the recommended age of twelve play. Travel game. It could be fun to play this game during an extended road trip or a visit to another country. You’d certainly spread your cards further. It might also be a way to meet some new people in a new destination. And it might actually be easier to play in a place where no one knows you and the fear of judgment is less. A few of the Care and Surprise cards. Surprisingly, this game goes beyond just unloading your cards as fast as possible. When I went to register my deck at SneakyCards.com, I was pleasantly surprised to see that the creators have set up a community based around this game. You can share your photos and experiences on social media using relevant hashtags and they might be picked up and placed on the game community website. Hopefully, the game will grow in popularity and enough cards will get out there that this will become a really fun place to visit. Even after you’ve finished the game, you can tune in and see how other people are doing. You can also submit a card idea and it might be included in a future edition of Sneaky Cards. The one negative of the game (aside from any issues you have with public displays of silliness) is that you can really only play it once. Since you give all your cards away in order to win, once you’ve won you can’t really do it again unless you buy another set. Of course, the concept is simple enough that you could easily make your own deck of cards with different activities and play it again that way. Sneaky Cards isn’t something you buy for game night or as a game to add to your collection for multiple plays. It’s a “one and done” activity that’s designed to get people interacting, having silly fun, and being nicer to each other. If you’re looking for a board game, this isn’t it. If, however, you’re looking for a fun activity to do as a family or group, or if you just want to have some silly fun for a few weeks, this could be the activity for you. 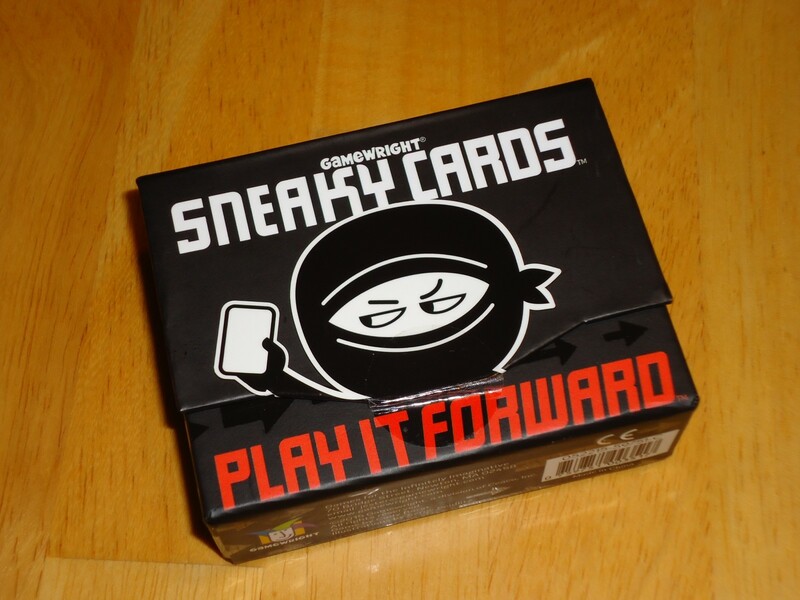 iSlaytheDragon.com would like to thank Gamewright for sending us a copy of Sneaky Cards: Play It Forward for review. Online tracking of cards in the wild is a nice addition. Small enough to take with you everywhere, so you can get rid of cards at any time. The community surrounding the game could be a lot of fun if it takes off. Lots of uses for this activity. Gives players an opportunity to meet new people and try new things. You will subject yourself to some embarrassment. Not a "game" in the traditional sense; no tactics or strategy to be had here. Can only be played through once.